TL;DR When running multiple performance campaigns on Facebook, it is crucial to have all important statistics in one dashboard. This is the reason why we created a brand new Campaign Manager, a fully personalized and efficient tool for data analysis connecting Facebook with Google Analytics data at one place. We understand that every client and every marketer has different needs. There is no one dashboard that suits everybody. ROI Hunter’s new Campaign Manager (currently in Beta) is 100% customizable. You can create your own charts, tables and filters. All settings can be stored for later use or shared with your colleagues via URL. You can easily set up your own view. Why not have Facebook data such as Spend or Clicks together in the same table with Google Analytics data such as Goals, Transactions or Revenue? Is ROI your KPI? Just select it from the options menu and drag & drop it into your personal list on the right. You will be able to sort or filter the statistics table by all selected columns. 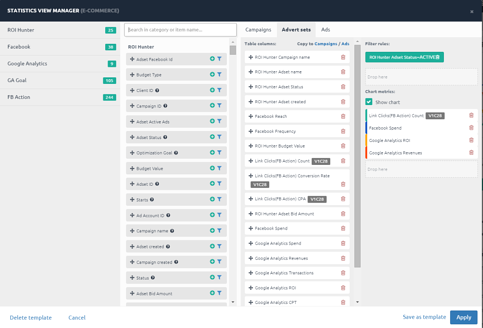 You can set up different table columns for Campaigns / Ad Sets / Ads layers and save all your views as a template for later use across all virtual clients in ROI Hunter. Even switching from eCommerce statistics to mobile-app installs or lead-generation is a piece of cake. No worries, we’ve also prepared some default views that you can use for an easy start. Sometimes you might need to compare the performance of different campaigns, ad sets or ads in time. You can put up to 5 different elements into one chart and see their performance pattern during the selected time period. Thanks to this great feature you can for example find out which ad set caused the huge decrease in Spend in only a few seconds and thus act quickly. Obviously you can also export the table to a CSV file and edit budgets, bids or targeting in bulk. We hope that our new Campaign Manager will help you analyze your data more efficiently and scale up your performance! Tip: ROI Hunter clients can read more about Campaign Manager in our Wiki. Campaign Manager currently supports Facebook & Google Analytics data. Omniture, Adjust and more measurement tools are coming soon!